In the past decade, dollar stores have popped up in every neighborhood, large or small. Whether you live in an urban area with an independent dollar store or in the suburbs where dollar store chains roam free, there’s a good chance that you’re missing out on some serious savings if you’re walking buy the store without checking it out. Not everything in a dollar store is worth your dollar (nor do all things in there cost a dollar these days), but there are many items you can grab for a buck or two that will serve you just as well as the pricey versions from the grocery or super stores. Many dollar stores have a wide array of pre-packaged and prepared snacks and food. Here are the ones to buy that will be the same as the food found in your supermarket. 1. Soups. Even name brand soups and low sodium/low fat versions of soup can be found at dollar stores. 2. Bulk candy. Giant bags of licorice, hard candy and lollipops can be found for a steal to fill bags for you kid’s birthday party. 3. Crackers. Check the date on these, but there are plenty of crackers to be found at dollar stores. 4. Fruit juices. You may not find the 100% real fruit juice found at a dollar store, but boxed fruit juices and the type found in jugs can usually be had for a dollar or two. 5. Soda. Many dollar stores now stock Coca-Cola and their other products. You’ll always find off-brand cola products too. 6. TV dinners. If you’re going to buy a TV dinner, it may as well be cheap since the pricey ones you find at the grocery store contain just as much salt and fat as the low end versions found at the dollar store. 7. Gum. Gum fanatics know that their chewing habit can add up quickly. Grab your gum at the dollar store. Some even sell it by the box. 8. Noodles. The quick cooking noodles like Ramen or Cup O’ Soup can be found at most dollar stores for next to nothing. 9. Stock. Chicken, beef and veggie stock can be found at many dollar stores. If you’re trying to cut the sodium, dilute what you use with water to keep the flavor while using less of the salty stock. 10. Pickles. Pickles are a mainstay in some households and can be found at the dollar store. They may only have whole pickles, so be prepared to go home and slice them, but considering the fact you’re saving a few dollars, that’s no biggie. 11. Tuna fish. Canned tuna fish and salmon can be found at dollar stores and are often the same brands you find at your supermarket. 12. Extra virgin olive oil.If you use EVOO in your cooking daily, you know it can be pricey. Buying it at the dollar store saves money and since you’re cooking with it, you don’t need the fancy schmancy cold-pressed kind (which is best for dressings or consuming straight up). 13. Cashews and almonds. Some dollar stores have an array of raw and salted nuts, especially around the holidays. These are great for putting out for guests. 14. Sugar. Sugar is cheap at the grocery store, but it’s even less at the dollar store. A sizeable bag of sugar can go for a dollar or two and goes just as far as the $4 bag from the grocery store. 15. Eggs. Oh yes. Some dollar stores have refrigerated sections with eggs. While you won’t find any organic eggs, the standard kind can be found for under $2 versus the almost $4 you’ll pay at the market. There are items you use every single day that can come from the dollar store. Remember that the quality of products offered vary from store to store, so if you’re in a new area with a dollar store, it may be worth visiting to see if they have better brands than what’s stocked at your usual store. 16. Cleaning products. Not every cleaning product sold at the dollar store will work as well as the house or name brand found at a super market (we know, we’ve tried, but items like glass cleaner and furniture polish are safe bets. 17. Toilet bowl cleaner. If you go through these fairly quickly, buy it for a dollar and don’t feel guilty about ditching it. 18. Baking soda. There are so many uses for baking soda and buying it at the dollar store will save you money each time you go through a box (use it to freshen the fridge, cure itchy skin and create a base for eco-friendly homemade cleaners). 19. Vinegar. Like baking soda, this product has many uses and can be purchased in large jugs at the dollar store. 20. Paper towels. If you run through paper towels like crazy in your home, the thicker versions sold at the grocery store probably don’t matter. Or buy a pack at the dollar store to keep on hand for the kids, who are usually known to waste paper towels. 21. Toilet paper. Tread carefully with this one. If you’re super picky about toilet paper, the kind from the dollar store isn’t for you, but if you’re living on a serious budget, it may be an area you’re willing to work with. 22. Zip top plastic bags. In the past it was only the rinky-dink sandwich bags that were sold at dollar stores, but now we’re seeing zip top plastic bags. These bags are available in various sizes and work for freezing food, meaning you waste and throw out less. 23. Plastic containers. They won’t be Tupperware brand, but who cares? They’ll hold and store your food just the same and if you lose one or leave it at work and it gets stolen (hey, we’ve heard of it happening), it’s no big deal. 24. Air freshner. Air freshners of every type, from sprays to oils can be found at dollar stores to add a fresh scent to your home. 25. Tea towels. If you cook a lot, you know that having a dozen or so tea towels is helpful for quickly wiping off your hands when you’re in the kitchen. Grab them at the dollar store, since the ones we’ve purchased have held up just as nicely in the wash as those purchased at pricey home boutiques. 26. Pot holders. Pot holders are expensive, even at the grocery store. While your dollar store may not have the most sophisticated designs or colors, they will have them for a bargain. 27. Batteries. On a recent trip to a dollar store, we were elated to spot lithium batteries for about 30% less than we’d seen them at a drugstore just up the street. Not all dollar stores will have lithium batteries, but they will have standard batteries which work in most children’s toys and games. Lithium are best for digital cameras. 28. Bath soap. Bar soap for the shower can be purchased at the dollar store for far less than a grocery store. They even have name brands, so you don’t have to worry about an allergic reaction (though that can happen with any brand). 29. Shaving cream. Most men aren’t too picky about what shaving cream they use, so why buy it anywhere else? 30. Tape. The dollar store has all kinds of tape! Duct tape, masking tape, gift-wrapping tape. Score it for a buck and keep it organized so it’s always ready to go. What else can you snap up for a buck? Here’s a look at a few more items worth exploring the next time you’re at your local dollar store. 31. Gift wrapping paper. It gets tossed, so why spend $6 or more on a single roll? 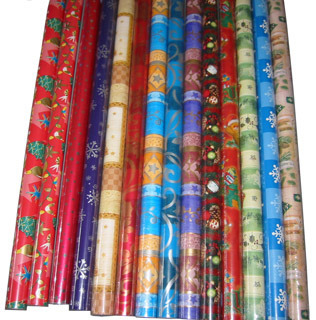 Hit your dollar store for seasonal gift wrapping paper and stock up so you always have it. 32. Party decorations. Items like balloons and crepe paper can cab found at dollar stores in an array of colors for every occasion. 33. Kid’s party supplies. Theme birthday plates, napkins, goodie bags and more are at most dollar stores. 34. Holiday decorations. Inexpensive paper decorations can be found to hang up around the house. These items usually can’t be stored and saved for the next year, but for the price it won’t be a big deal to throw it out. 35. Hair accessories. Bobby pins and hair elastics are always available at dollar stores and cost nowhere near the high prices found at grocery and drug stores. These tiny items are often lost, so buy them for less. 36. Kitchen supplies. Serving dishes, utensils, sponges and almost anything else you need in your kitchen can be found at your dollar store. Check for sturdiness and make sure hinges are in working order. 37. Dishes. It won’t be fine china, but it will look chic. Choose a solid color like white or navy to make your meals look fabulous without spending a bundle. 38. Kettle. Have you priced a kettle lately? $30-$40 is average for a kettle, but you can find them at the dollar store for about 10 bucks. It will heat water for your tea just the same too! 39. Beach toys. Foam noodles, frisbees and sand castle supplies are a bargain at the dollar store. 40. Coloring books. If your four year old goes through more coloring books per week than pairs of socks, snag a few at the dollar store to keep him or her occupied for cheap. 41. Art supplies. If you’re starting a career as an artist, the dollar store isn’t for you, but for crafty kids and teens who need their art supplies replenished monthly, the dollar store has great bargains. Paint brushes, paints, watercolors, and sometimes even sketch pads can be found for a few dollars each. 42. School supplies. During back-to-school season, super stores run great deals on school supplies, but after the school year’s set in, forget it. Go to your local dollar store for pencils, pens, spiral notebooks and folders for the kids. If you haven’t stepped into a dollar store in ages, now’s the time to go! Forget the musty spaces with expired goods and low quality products. Today’s dollar stores are just as bright and shiny as your favorite super store and stocked with products that are already on your list, only for a lower price.